Inspired by the marvelous posts of fellow blogger Allen of N.H. Garden Solutions, I decided to keep my eyes open for mushrooms and other such growths when I made my forays into the woods last weekend. Allen always seems to discover a veritable cornucopia of vegetation, mushrooms, lichens, and slime molds, but my “catch” was much more modest (and I can’t even really identify the items I saw). 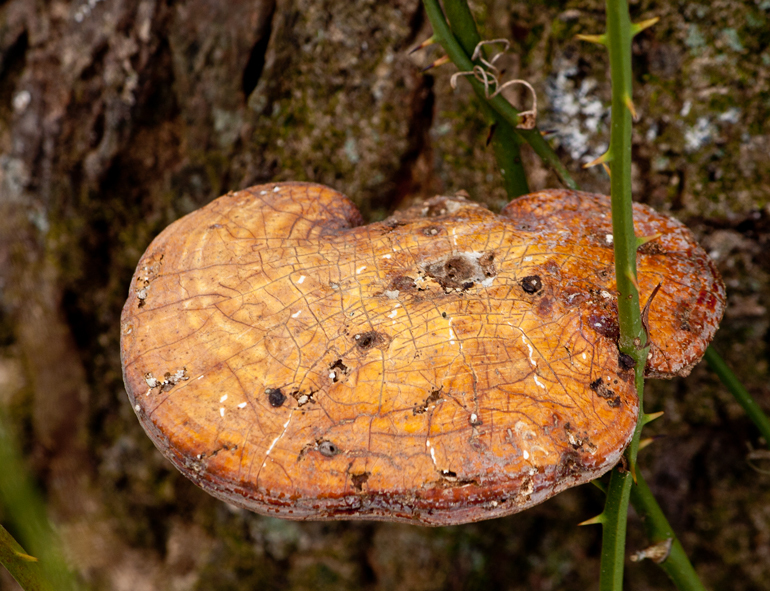 The first photo depicts what I think is a somewhat weathered mushroom that was growing on a tree mostly surrounded by green vines with very sharp thorns. I really like the texture of the surface of the mushroom and its coloration. 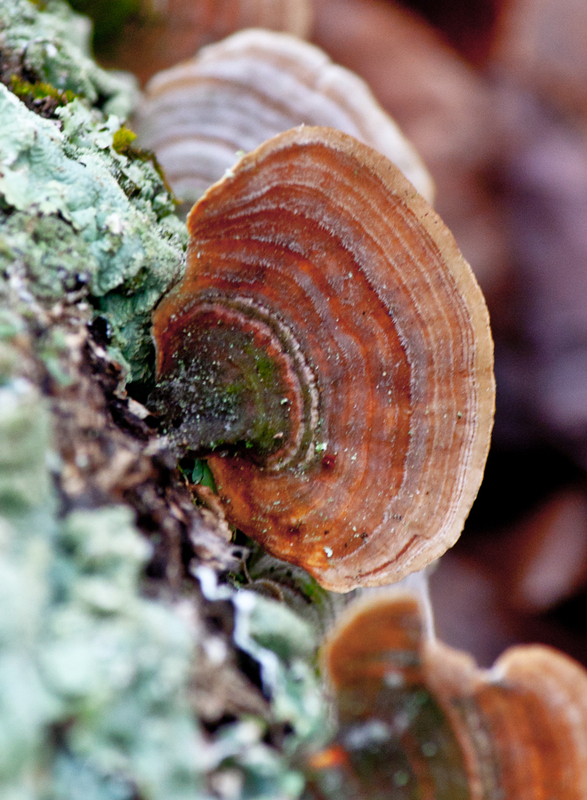 The second photo shows some kind of mushroom, possibly a kind of turkey tail mushroom. I like the concentric multi-color pattern, which reminds me of the growth rings of a tree. In many ways these mushrooms are as beautiful and as colorful as the flowers that will be coming up in a few short months—I will have to keep my eyes even more wide open when I am outdoors now. 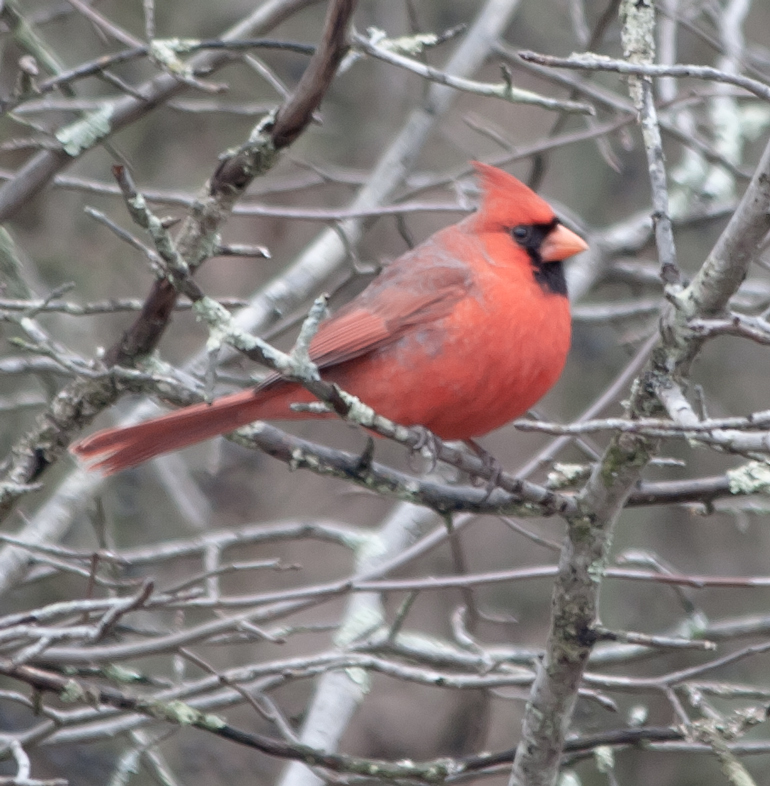 I have seen some rotund cardinals this winter, but this male Northern Cardinal has to be the roundest one yet. He looks a bit to me like an overinflated balloon figure. I saw him fly away, so I know he is airworthy, but I am pretty sure that his current shape produces more aerodynamic drag than usual. On the other hand, maybe he is merely big-boned. 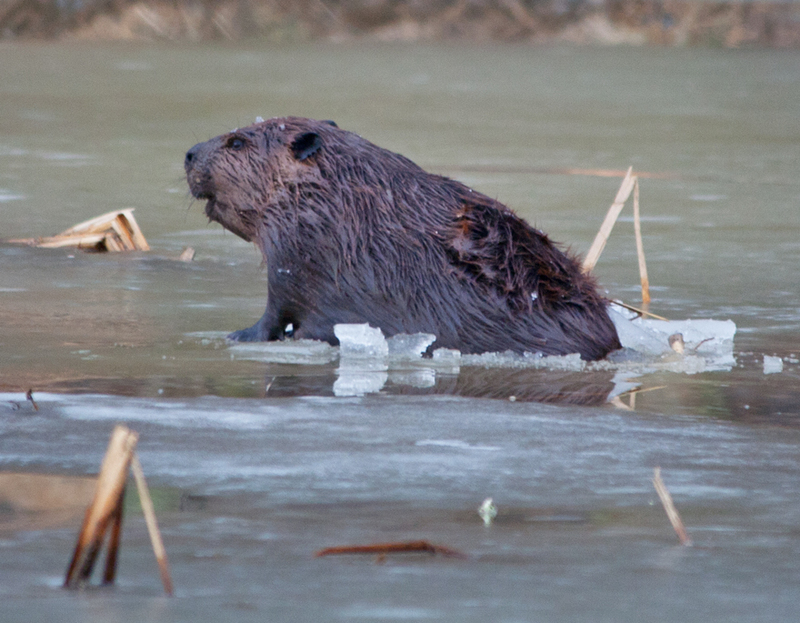 The beaver had disappeared from the small open water area of the ice-covered beaver pond. Wondering if he would resurface, I stood in silent readiness with my camera still in my hand. My eyes were focused on one area of the pond, but my ears detected a sound emanating from another location near the edge of the pond. 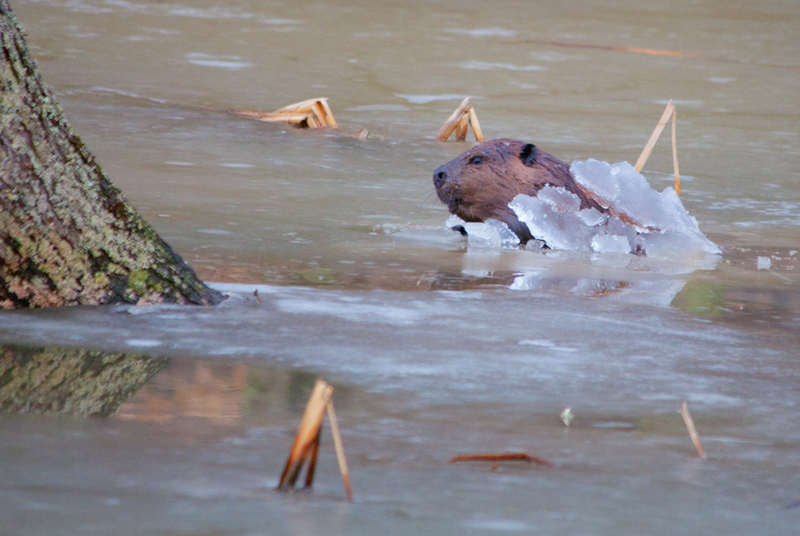 Somehow I knew instantly what was about to happen—the beaver was about to achieve a breakthrough. The light had faded a bit and I couldn’t see well enough to focus perfectly, but I aimed at the source of the sound and got this shot of the beaver poking his head through a newly-created hole in the ice. From this perspective, it looks like the beaver is pretty small. 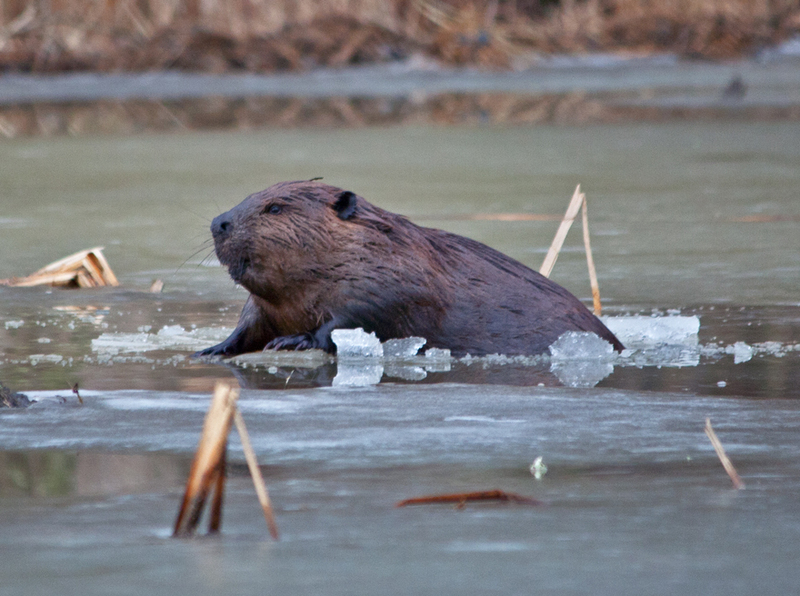 As I watched, the beaver placed his front paws on the ice, which appeared to be able to support his weight, and gradually pulled his body out of the water. Naturally, the small hole became a lot bigger as his large body came increasingly into view. After the beaver was completely out of the water, he bent down over the opening that he had just created. Perhaps he was trying to decide if he needed to enlarge it further or was trying to free a tasty-looking stick from the ice. 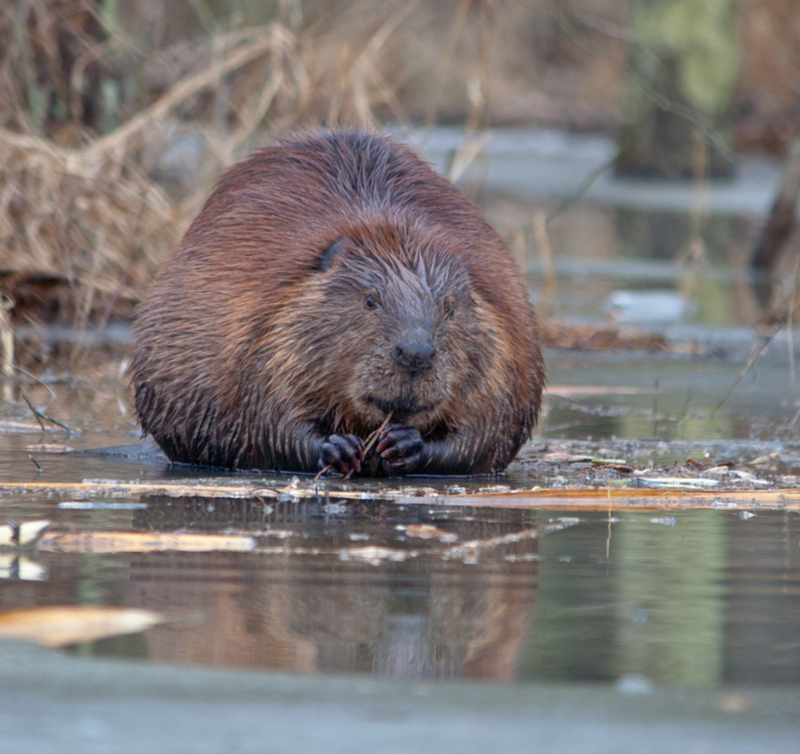 It almost looks to me, though, that he is peering into the water, wondering if one of his fellow beavers is going to be popping up to join him. The beaver did not linger long at the new location. After a few seconds on the “outside,” he dove back into the icy waters of the pond. There are few moments in life that are truly “once-in-a-lifetime” experiences, ones that would be impossible to replicate, but I have the sense that this was one of them. So many things had to work together to make these photos happen—the timing, the location, and the ice, to name a few. It is supposed to get up to 70 degrees (21 degrees C) today and the ice will almost certainly be gone by the time I am able to return to the marsh this weekend. Perhaps I will get to observe the beavers eating or working or playing or maybe they will remain in the lodge. In either case, I can be happy, knowing that we shared a really special moment together. 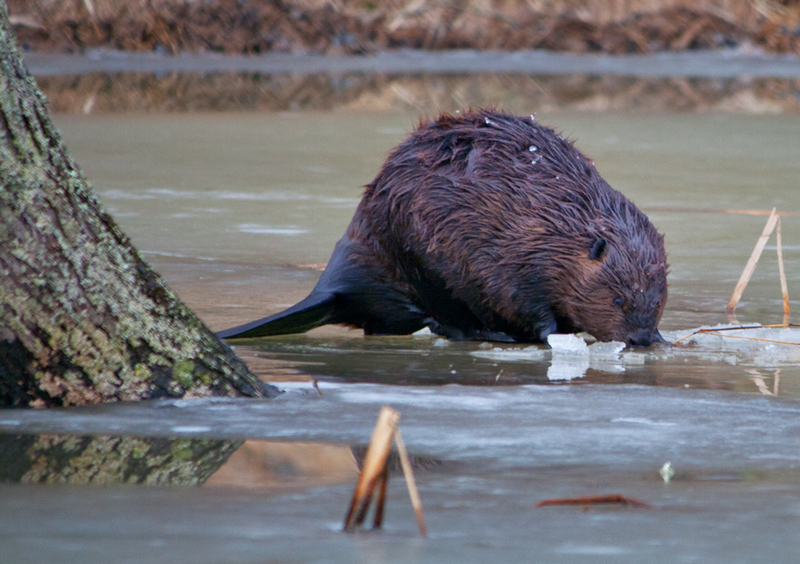 Who knew that a beaver could be so cute while he is eating? I am still working on putting together a series of photos of the local beavers, but thought I’d post another one of my favorite images in the interim. I was surprised that the beaver did not notice me (or simply didn’t care) when I was taking this photo. Not only was I looking straight at him, but I also got as close to the level of the ice as I could to get this low-angle shot. 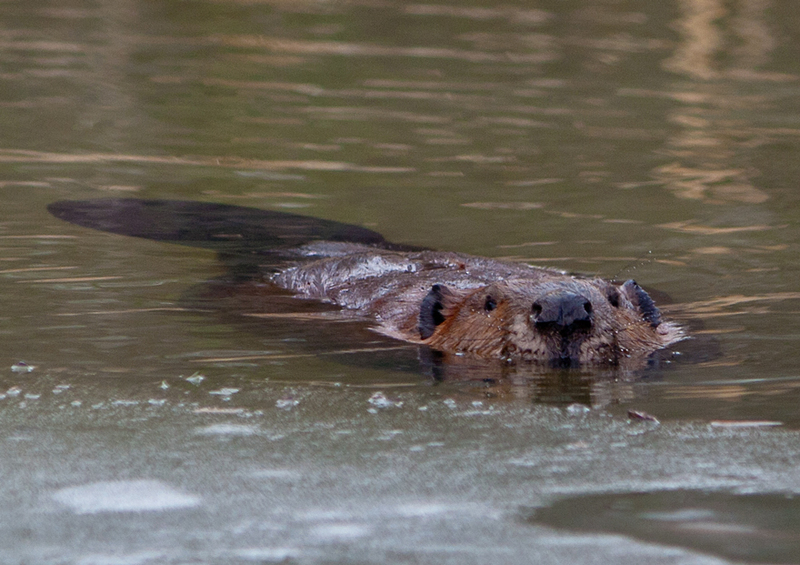 I got down pretty low to take this shot of a beaver at my local marshland park as he swam in my direction. I especially like the the reflection of his face in the water and the fact that his tail is visible. The ice in the foreground helps to give some interesting context to the photo. During other seasons, the beavers would immediately dive whenever they sensed my presence, but the last week or so the beavers have been much more wiling to tolerate me (and others). 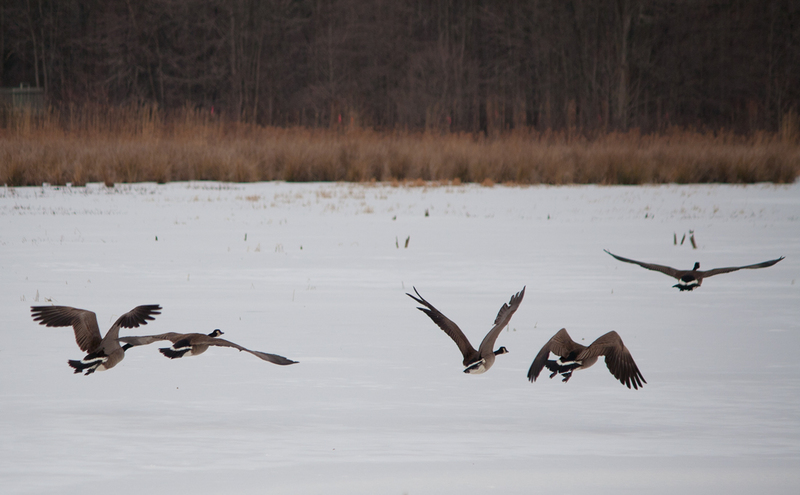 Maybe the ice on the pond forces them to stay closer to home and to venture out more during the daylight hours rather than at night. The crisscrossing pattern of the vine and the cooperative pose of the Song Sparrow combine to make this photo one of my recent favorites. It is always exciting for me when the elements of an image work together in interesting and unexpected ways. 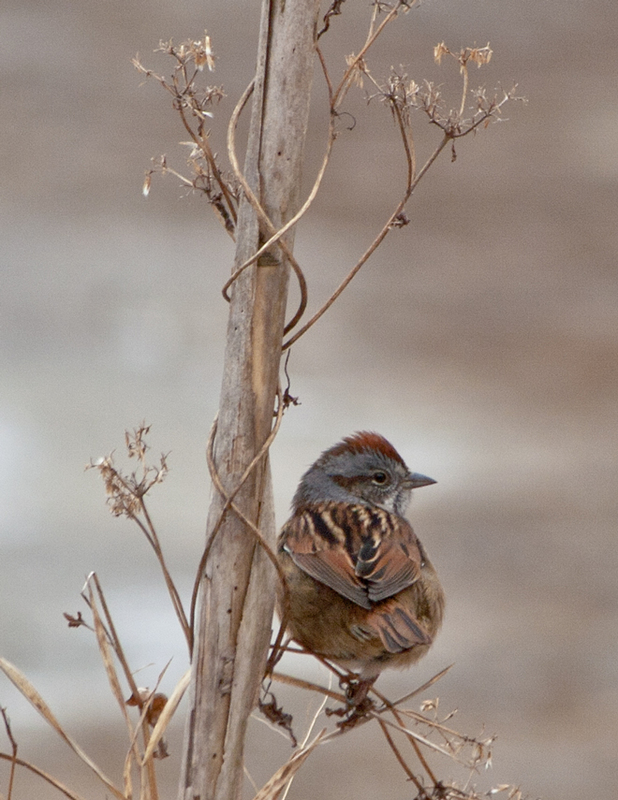 I was attempting to photograph this Song Sparrow (Melospiza melodia) when he flew onto this stalk. He was facing away from me, but I kept shooting and them he turned his head. I am not sure that I could have intentionally come up with a more interesting pose—I love the way we are looking down his back and get to see his wings and also get a clear view of his face. When I first looked at this photo, though, what caught my eyes the most were the crisscrossing vines, an unanticipated bonus. The X-shape of the vine is both linear and curved at the same time and I chose to crop the photo to highlight this feature. One of the things that keeps me thrilled about photographing nature is the balance between preparation and spontaneity, between technical excellence and creativity. I try to put myself into situations outside in which I know there is a chance that I will see something interesting and then prepare myself (and my camera) to take advantage when something does happen (and it’s usually not what I anticipated).